As strong advocates of investing in and nurturing skills and talent, leading roof tile manufacturer, Russell Roof Tiles is proud to have promoted a former trainee to Manager, after he benefitted from a number of career-enhancing opportunities over eight years. Having been promoted to Business Support Manager, 26-year-old Daniel Hancox, who lives in Burton, began working at the roofing tile manufacturer when he was 18-years-old. He had wanted a role with an excellent career path and training opportunities and Russell Roof Tiles had been able to offer this. Russell Roof Tiles currently employs 180 at its three sites, one in Lochmaben and two in Burton on Trent, and has always been strongly devoted to enhancing the skills of its staff through significant and important training. This saw the team previously win Employer of the Year in the Burton Mail Business Awards and earlier this year, the manufacturer announced its biggest training investment to date, devoting £60,000 in health, safety and environmental training for a large number of its supervisors, apprentices and maintenance personnel. From the start of Dan’s career, Russell Roof Tiles has contributed heavily to his training and development. This saw Dan undertake a Business Management degree part time for four years at Staffordshire University, eventually gaining a 2:1 accreditation with the support of Russells. Further training has also included an auditing course and a health and safety qualification. Internally, the management team was keen to enhance Dan’s skills and knowledge with on-the-job training. Gaining experience across all departments and disciplines over the eight years, Dan gained an over-arching picture of the business, which is important to the new role. Dan’s new title was created following the retirement of National Operations Support Manager, Alex Gilroy last month. Having worked and trained with Alex for 18 months in preparation, 50 per cent of Dan’s responsibilities will include Alex’s previous role. In addition, Dan will be taking responsibility for Russell Roof Tiles’ plastics site in Burton, including health and safety and supplier relationships, while also overseeing significant projects such as the upgrading of technology and computer systems. Dan Hancox said: “Russell Roof Tiles has always been a company that promotes within and provides excellent training initiatives. If you are willing to learn and work hard, then you will be able to reap the awards and strive in your career. 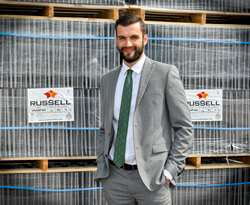 Andrew Hayward, Managing Director at Russell Roof Tiles added: “Dan has been a significant part of the Russell Roof Tiles team almost eight years now and his new promotion is a result of his hard-work and dedication to the business. Russell Roof Tiles is a pioneering independent roof tile manufacturer, providing roofing solutions for leading UK house builders and high profile social housing projects. The company specialises in manufacturing concrete roof tiles and plastic accessories.